This morning I woke up at 5:30 trying to get present. That means I woke up feeling my heart beating hard and my chest feeling tight and my thoughts whirling around in my head. So I took a shot of Rescue Remedy and tried to get present. I tried not to think about all the things I have to get done before the launch of my Chocabaret Kickstarter campaign in one short week. The “now” one short week that’s been nine months in the making. Then there’s all that is related: submit final campaign for approval, send out press release, write the blog posts, and I still have to confirm a chocolate maker or two… Then there’s the literally hundreds and hundreds of emails I have to write… Oh, and I have to sing and look rested and relaxed for my live launch. Oh crap, I still need a musician to accompany me in my kitchen on Monday… no Tuesday, Tuesday, Tuesday. The launch is on Tuesday! Get present! Get present! Get present! Panic is what happens when I look at the mountain of stuff I have to do. The same panic and fear that’s been skipping hand-in-hand with the excitement and exhilaration I’ve been feeling all these months. It’s been a roller coaster ride. One moment I feel brave and brilliant, the next I’m in the fetal position on my sofa, curled around my cat wishing I could switch places with him… wondering do I put myself through this? Why? Why? Why! What makes me think I can do this? I can’t do this! So I breathe and I try to get present. Be here now as they say. And I try to focus on two things: my purpose and my believers. Whenever I talk about my new show, Chocabaret: where an artisan chocolate tasting meets a cabaret show”, the faces of the people I’m talking to light up. There’s the why I’m doing this. Right in the old Merriam-Webster. The truth is I haven’t put on a show for the public in almost ten years. I’ve been hiding. I got SCARED when my last New York show got great reviews, but not enough bums on seats. After lots of successful shows I did one that did delight the audience, the reviewers, the owner of the venue, but it did not delight my bank account and had me screaming never again. I’ve been letting fear win and turned delight down—not off—but way, way down. I’ve been dealing it out like cocaine. I have NOT been being myself. I’m here to delight and through my a chocolate tasting set to music I will achieve and live my purpose. And then there are my believers. In my life and especially in the past nine months I’ve had an army of family, friends and colleagues who believe in me. They’ve been and continue to be incredibly generous with their time, their resources and their words of encouragement. There are days when all I have to run on is their steam, their belief. They champion me and I would not be able to create courage over and over and over and keep moving forward without them. So here I am on the seven-day-countdown-to-gotime. It’s going to be a rocky week, but I’m here. 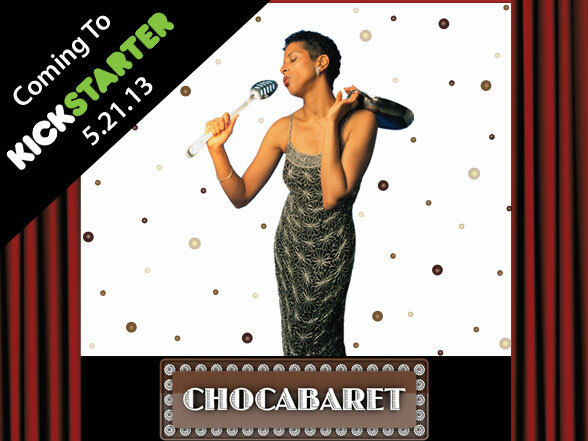 I will be launching my Kickstarter campaign in a live launch on Tuesday May 21st, 2013 in my kitchen cooking, singing and talking about chocolate. I look forward to seeing you there and/or at my show in October. The show will happen if the Kickstarter campaign is a SUCCESS. With your help it will be. Thank you.